US President Barack Obama has used his first formal TV interview since taking office to reach out to the Muslim world - saying Americans are not its enemy. Speaking to the Dubai-based Al-Arabiya network, Mr Obama reiterated that the US would extend the hand of friendship to Iran if it "unclenched its fist". It comes as his Middle East envoy, George Mitchell, travels to the region, heralding a new burst of diplomacy. He will meet Egypt's leader to discuss the Gaza ceasefire and peace efforts. Egypt has been mediating between Israel and the Palestinians, and between rival Palestinian factions Hamas and Fatah. Mr Obama told Al-Arabiya that the US sometimes made mistakes and stressed that his administration would adopt a more open diplomatic approach. "As I said in my inauguration speech, if countries like Iran are willing to unclench their fist, they will find an extended hand from us," he said. "It is very important for us to make sure that we are using all the tools of US power, including diplomacy, in our relationship with Iran." On Middle East peace, Mr Obama reiterated his administration's support for Israel and its security but also suggested Israelis would have to make some tough choices. "Ultimately we cannot tell either the Israelis or the Palestinians what is best for them. They are going to have to make some decisions," he said. "But I do believe the moment is ripe for both sides to realise that the path that they are on is one that is not going to result in prosperity and security for their people. And that instead, it's time to return to the negotiating table." 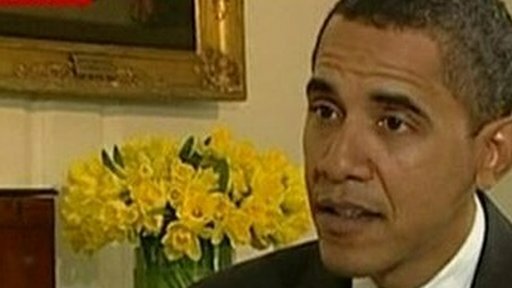 Asked about verbal attacks made on him in recent videos released by al-Qaeda, Mr Obama responded: "What that tells me is that their ideas are bankrupt." The BBC's Justin Webb in Washington says that for most of the interview, Mr Obama appeared determined to be emollient and - as he put it repeatedly - respectful, stressing that the US would begin by listening rather than dictating. As well as meeting Egyptian President Hosni Mubarak, Mr Mitchell is to visit Israel, the West Bank, Jordan, Turkey and Saudi Arabia during a week-long tour, as well as making stops in Europe, said state department spokesman Robert Wood. He said Mr Mitchell would meet "senior officials to discuss the peace process and the situation in Gaza". Speaking earlier at the White House, Mr Obama said the new envoy would take an active approach. "The charge that Senator Mitchell has is to engage vigorously and consistently in order for us to achieve genuine progress," he said. "And when I say progress, not just photo ops but progress that is concrete." It remained unclear whether Mr Mitchell would travel to the Gaza Strip. Separately, EU foreign policy chief Javier Solana said he was heading to the Middle East to join efforts to cement a permanent ceasefire. 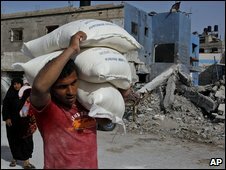 The diplomatic moves come a day after European Union humanitarian aid chief Louis Michel blamed the militant movement Hamas, which controls Gaza, for the humanitarian crisis there. He called the destruction left by Israel's offensive "abominable", but said Hamas bore "overwhelming responsibility". About 1,300 Palestinians, including 400 children, were killed in Israel's 22-day assault, while 13 Israelis died, some as a result of Palestinian militant rocket fire. Israeli and Palestinian faction representatives have visited Cairo for talks with Egyptian officials since a non-negotiated ceasefire came into effect on 18 January. Hamas wants an end to Israel's punishing blockade of Gaza. Israel, which will hold a general elections on 10 February, wants a long-term ceasefire and curbs on Hamas re-arming.